If you’re my age you might not of heard of Richard Linklater. Or maybe you do. Or maybe you’ve seen his must commercially successful films “School of Rock” but had no idea about the man behind it. Well anyway, Linklater has been busy for for the past 12 years putting a film together about a boy growing up. I myself was hooked at an instant, but others I’ve talked to about the film, weren’t as convinced. Either way check out the trailer below, which features “Hero” from the Indie Rock band Family of the Year. We are currently in the middle of San Diego Comic Con, and it’s nearly time for Marvel Studios’ panel. Here’s to hoping we find out what movies we will be seeing in Phase Three of the Marvel Cinematic Universe. 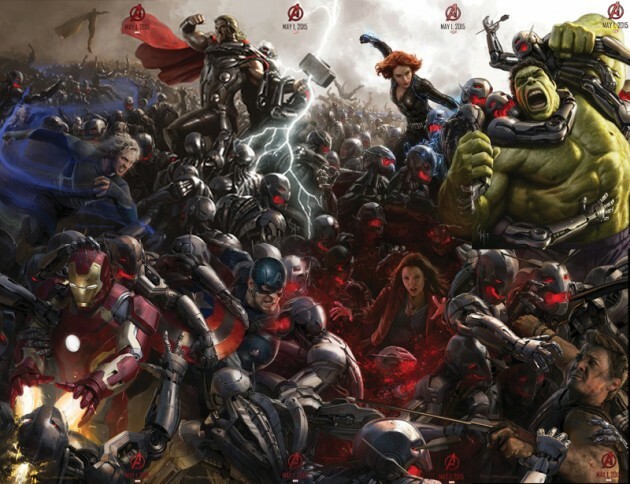 In the meantime, enjoy this concept art, for Avengers: Age of Ultron, that was slowly revealed, and has now been completed. (UPDATE) While I was expecting my twitter feed to be blown up by the end of the Marvel Studios panel at SDCC, this was not the case. Only a sequel for Guardians of the Galaxy was announced. And so the speculation continues, for what will become of Phase Three. My guess is something like this: Ant-Man, Captain America 3, Doctor Strange, Black Widow, GotG 2, Black Panther, Thor 3, Inhumans, Avengers 3. While I’ve only just managed to see X-Men: Days of Future Past, its release could not come at a better time, as it wasn’t until this year that I finally discovered the film franchise, based on the long running comic series, that started fourteen years ago. After catching up with the X-Men’s past, I am now looking at their future, and in which ways we could be seeing more of the Uncanny X-Men on screen. Here are some ways 20th Century Fox could be making some more money, off the films that have already made 2.9 billion, and counting, at the box office. #1 Apocalypse – Not even my idea here, as it has been confirmed to be the next film in the series, hitting cinemas in 2016. Taking place in the 1980’s, it will feature the ‘first class’ cast, and will introduce younger versions of Cyclops, Jean-Grey, Storm, Nightcrawler, and Gambit (who will be played by Channing Tatum). The return of Kurt Wagner, and the introduction of Gambit sounds promising. If you walked out of Future Past confused about time travel and timelines, better get you head around it, as this film will most likely take place in the new timeline that Wolverine created. Sounds like it will be a hit coming off the success of DOFP. #2 Wolverine 3 – At the very end of Future Past, Xavier sits Logan down to tell him everything that has happened to him in this new timeline, before the screen cuts to Mystique, posing as Stryker, rescuing him from the bottom of the ocean in 1973. But we see nothing more. The next solo Wolverine film, which will be released a year after Apocalypse, should really show Logan in this new timeline, and how it all lead to him being a history teacher at the school. #3 X4 and X5 – The Last Stand left us with the death of Cyclops, Jean-Grey, Prof. X, and the loss of Magneto’s powers. When we left Brett Ratner’s one-and-only X-Men film, Magneto was slightly regaining his powers, and a post credits scene showed that Xavier might be somehow still alive. Cut many years ahead to Future Past, Magneto’s powers have fully returned, and Prof. X is most definitely alive. But there is no explanation for this at all. I would love to see one, or even two films, focusing on Xavier, Magneto, Kitty Pryde, Storm, and Ice-Man as they reach the events seen in Future Past. Have the plot focus on first the group directly after The Last Stand, and then there involvement in the war. One cool thing about this, is that we would be able to see more of Bishop, Blink, Sunspot, and Warpath, all who weren’t a major part of the Future Past. Fan Bingbing, who plays Blink, revealed recently that DOFP is the first X-Men film out of her five film contract that she signed with 20th Century Fox. Mockingjay Pt. 1 Poster revealed! Last week I had the pleasure of viewing Saving Mr Banks, the historical drama staring Emma Thompson and Tom Hanks, which details the development of the 1964 Walt Disney studios film, and subsequently P. L. Travers’ fortnight long stay in Los Angeles as she is persuaded by Walt Disney, to sign over the screen rights to her novels. Leaving the cinemas after the two hour long film, I felt a mix of emotions. As well as showing the audience the troubles of developing the film, we see Travers childhood. Being non-linear, the plot travels between California in the 1960’s and Outback Australia in the 1900’s, giving us insight into why Travers is the way she is. The audience watches as her father fights a losing battle with alcoholism, and as Travers (nicknamed ‘Ginty’ by her father) watches her mother attempt suicide. Admits the sorrow I felt for the Travers character, the screen lit up every time Hanks featured on the screen. The emotions I felt where the same I feel every time I enter a Disneyland, or watch a Walt Disney Animations film. Pure joy and inspiration to create. And I could tell the rest of the audience where loving the Hanks scenes, one in particular where Travers and Disney go to the park for a ride on King Arthur’s Carrousel. Upon arriving home, I decided to do a quick google search on both of the interesting characters, and discovered that Tom Hanks is the first man to ever play the icon, Walter Elias Disney. Some one hundred years after his birth, and nearly fifty years since his death , and it’s only now we get to see a tiny behind-the-scenes look at a man who brought joy to so many children’s living rooms. And it isn’t like there is not enough material to make a film on the legend. Walt Disney, although having a relatively short life, had many aspirations and completed a lot in his life time. The film could be able to show his early life and work with the red Cross, his beginnings in animation and the development of Mickey Mouse, being a pioneer of feature film length animations, creating Disneyland, his personnel life with Lillian Disney and his dark sides, and unfortunate death. Casting would be easy, as Tom Hanks has already been proven perfect for the role, and maybe even Emma Thompson could make a small cameo. It would be a nice touch.